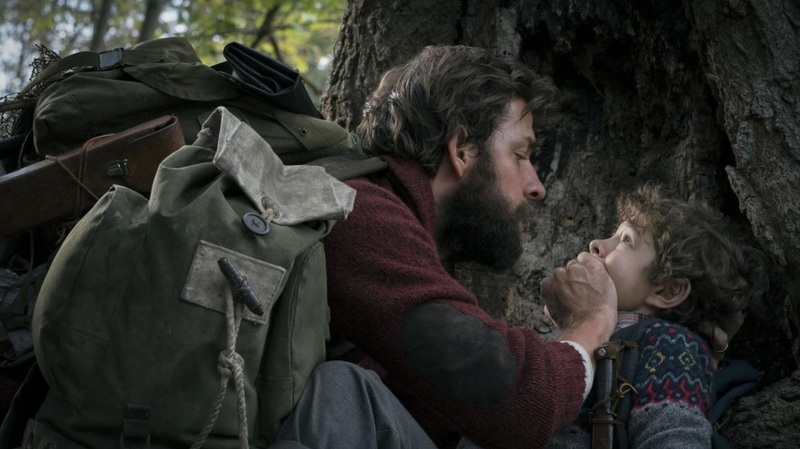 A Quiet Place is built off of a premise that makes itself known even in the title: The world is quiet. Anyone who makes a sound places themselves in immediate peril of being violently destroyed by any one of a group of sound-hypersensitive monsters that have taken over the country, and possibly the world as well. The idea of a movie in which the characters cannot speak is an interesting concept, and a particularly inviting one for the horror genre, in which so much can be drawn from jump scares and loud noises. Indeed, A Quiet Place makes plenty of use of these. In this way, the movie benefits from the rules it sets for itself, because in a world of so much silence, each jump scare is that much more arresting. There are other common horror elements at play in this movie, from the horrifying images of the monsters themselves to some of the concepts on the screen, like when the children (Millicent Simmonds and Noah Jupe) nearly drown in a silo and are unable to scream out for help. But what ultimately makes this story so frightening is the devotion that everyone in the family feels toward everyone else. 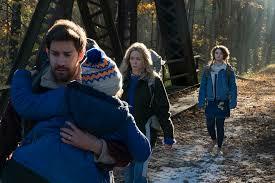 John Krasinski, who directed, co-wrote and co-starred in the movie, has said in interviews that he wanted the primary focus of A Quiet Place to be the family’s love and dedication, and he absolutely succeeded. He and Emily Blunt, his wife in real life, star as a husband and wife, Lee and Evelyn respectfully, who will do anything to keep their children safe in this dystopian world. Their love for the children is palpable, and small gestures and acts throughout the movie, like Evelyn’s attempts to teach her children reading and math, bring the audience closer into their minds and make it easier to sympathize with them. Which is, after all, the primary objective of so many horror movies, and for good reason: If the audience can come to sympathize with the main characters, then the concern for their safety will be that much more impactful and close, because it will feel similar to a concern for the safety of the self. Beyond its success within the horror genre, though, the film is fascinating in and of itself, in large part because it isn’t afraid to break its own rules. Or rather, it follows its own rules, but it explores them in so much depth that the viewers are allowed to view them both from within and from without. The main one, of course, is the principle of silence. The characters are unable to speak out loud, so they communicate through pantomiming, mouthing, and sign language. However, early on in the movie, Lee takes his son Marcus to a river, where the two of them are able to speak out loud for the first time in the film. The way Lee explains it, talking is loud, but the river is louder, which means it drowns out any sound of them being there, and they are safe for the time being. While this does seem to invite some more questions—namely, if talking by the river is safe, why doesn’t the family just move to the river?—it is also a crafty early indication that the film is ready to get creative. “Creative” is probably the best overall way to describe this movie. Bolstered by strong performances by all four of its lead actors, A Quiet Place, while unconcerned with background information (How did things come to be this way? What was this family like before all of this? ), is a skillful look into the strained, meticulous process of preserving love in the face of the apocalypse. A Quiet Place is currently showing at local theaters around Ann Arbor, including the Quality 16 and Rave Cinemas.